The focus with architecture is most often on the design of the building itself, but with most of us not able to jet around the world looking at pretty buildings, it's photographs that build the vast majority of our impressions of design. That's the (underappreciated) genre represented by the Arcaid Awards, which recognize the Architectural Photographer of the Year. 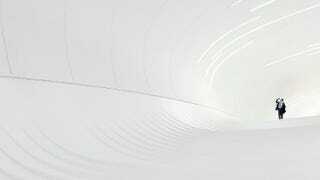 The winning shot this time around is of the interior of Zaha Hadid's Aliyev Center. It's not your standard architecture image of a towering skyscraper, with unrealistically-green grass and happy families in the foreground; rather, it's a starkly white environment that's more reminiscent of a futuristic hospital than a conference hall. "A good image to us has to be bold in composition, with strong architectural elements, ideally combined with capturing a moment. We don't set up or direct the people in our images, rather we compose the frame and then shoot people as they naturally explore the space. This hopefully results in images that have a narrative."